With breathless enthusiasm my daughter recounted her experience of swinging through the air. She's a camp counselor at Cannon Beach Christian Conference Center again this year, but she's working with older kids. Since she worked with preschoolers last year she never had the opportunity to "fly through the air" on the giant swing of the challenge course. But this week she and the other counselors who will be working with older kids are learning the ropes, literally. So yesterday she was carefully strapped into a gigantic swing and heaved up into the sky with strong, sturdy ropes of steel (well that's how I prefer to think of the swing my baby was on anyhow!). Then, when she was ready, she pulled a chord and swung fast and freely through the sky. Oh my! Abby had been on ropes courses before, but she had never swung on a swing like this one. It was a new experience for her. Obviously there was a lot of trust involved. She trusted the ropes system, the people who fastened her into the harness and her supervisor who checked their work. And my bet is she said a little prayer on the way up and trusted that the Lord would somehow deliver her safely through this experience. For most of us our faith has been built on the promises of God, but also on the experiences we've had with Him. We've prayed for friends, and He's provided friends. We prayed for the money in our bank accounts to stretch far enough to meet our needs, and He made them stretch further than we had hoped. We asked Him to get us through a difficult ordeal, and He got us through and built character and strength into our fiber in the process. Again and again we've watched God provide and bring us through the storms of life. And with each proof of His love and provision, we grew to trust Him more. But what about the new experience? What do you do when God calls you to something new? How do you respond in faith when God requires you to step out into the unknown? You may not have been down this very path before. New challenges may lie ahead that you never encountered before. And therein lies the test. Have you been trusting God? Or have you been trusting in the familiar? Regardless of whether or not you've ever encountered this particular challenge before, you have experienced God before. No, He's never walked you down this very path, but He's accompanied you on every other path. And He's proven Himself to be faithful. You can trust Him in new territory because He was faithful and good and sufficient in the places you've been before. Yes, this will be different. This season, this place, this experience, these people, this job, this school, this church, this ministry, this culture, this neighborhood, this house...will be different. But God will be the same. When God introduced Himself to Moses at the burning bush, He called Himself, "I AM WHO I AM." He was saying that He is self-existent, always the same, never changing and that all things hinge on Him. He later called Himself the God of Abraham and Isaac and Jacob. He was saying that He was the same God to each of those men. He was and is consistent. And He's the very same God to you and me, too. Yesterday, today and tomorrow. He is our one unchangeable. 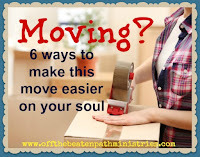 Whether you're moving into a new season of life or packing up and moving to a new place, you can count on two things. God will be the same. I realize that first statement may cause you same pain, some anxiety, a little frustration and resentment even. I get that. I don't like change either. But the fact that God is the same and He walks with you into new territory should settle those restless fears and insecurities. Trust Him. And swing high, my friend! You just may find that you like this new experience more than you ever thought you would. What new circumstance, place, job, calling or season has God called you to? I'd love to know and pray for you.